As you stand in front of the shelves in the pharmacy perusing the bottles of calcium tablets, you see a calcium phosphate supplement. Should you take that one, or calcium citrate? How about calcium made from oyster shells or bone meal? The number of calcium supplements continues to grow, and many people are confused about which type of calcium supplement to take. Calcium phosphate is one form that is less commonly found than others. It is most often combined with vitamin D to create one supplement taken upon the recommendation of a doctor to treat certain medical conditions or offset the calcium-lowering effects of prescription medications. Calcium is an essential mineral. Nearly every bit of calcium in your body is found in the bones and teeth. Your body cannot make its own calcium, but must obtain it from the foods you eat or from supplements. Calcium works in tandem with other vitamins and minerals to form strong bones and healthy teeth. It's also essential for blood clotting, proper functioning of the nerves, and muscle contraction. What Are the Best Liquid Calcium Supplements? Too much or too little calcium circulating in the blood can cause many problems. Too much calcium may lead to kidney stones. Too little calcium may lead to osteoporosis, or weakening of the bones that can lead to fractures, and other health problems. The best sources of calcium in the diet are dairy products such as milk and cheese, with dark green, leafy vegetables following close behind. Other sources of calcium include various fortified foods, such as calcium-fortified cereals and orange juice. When you eat foods containing calcium, your body breaks the food down during the process of digestion. The process of digestion begins in the mouth, with food passing from the mouth through the esophagus to the stomach for the next phase of digestion, and then from the stomach to the small intestine. Calcium absorption occurs in the small intestine. Some supplements such as calcium citrate may be taken on an empty stomach, but others, including calcium phosphate supplement pills, should be taken with food for best absorption. Among the various forms of calcium available as supplements, calcium citrate and calcium carbonate appear to the most easily absorbed by the body. Calcium phosphate is most often combined with vitamin D to create one supplement for bone health. Calcium supplements are typically made from either naturally occurring sources such as bone meal or oyster shells or made from minerals combined with other substances to form calcium citrate, calcium carbonate, or calcium phosphate supplement tablets. Among these three, calcium citrate and calcium carbonate are the most common. Calcium phosphate is less common. It is often combined with vitamin D3 in one supplement. Among the various types of vitamin D, vitamins D2 and D3 are considered the most important for health. D3 is normally produced in the skin after exposure to sunlight. Today, with more and more people concerned about the risk of skin cancer, and with more people working indoors during daylight hours, few people get enough direct sunlight exposure to make enough D3. Both calcium and vitamin D levels may be determined through a simple blood test. If your doctor orders such a test, the resulting information may lead him to recommend supplementation or another course of treatment. 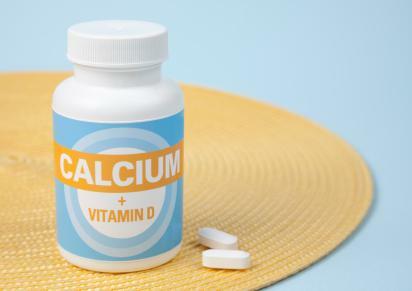 Your doctor may also recommend a calcium phosphate and vitamin D3 supplement if you have been diagnosed with osteoporosis, rickets, or hypoparathyroidism (an under active parathyroid gland). Some medications such as prednisone may also decrease the amount of circulating calcium in the blood; this supplement may be recommended if you are taking such medications. With all the supplements lining the pharmacy shelves, most people are only concerned with which one they should buy. Some calcium supplements are very expensive while others are inexpensive. Recent studies published in the American Journal of Nutrition and cited on the Calcium Information Center report that the body could just as easily absorb less expensive calcium supplements as others. According to The Calcium Information Center, calcium phosphate contains approximately 38% available calcium compared to similar doses and tables of calcium citrate and calcium carbonate, which each contain 40% available calcium. The choice of which calcium supplement to take is a personal one, but calcium phosphate on its own appears to be more expensive and slightly less effective than other forms. Eating calcium-rich foods shouldn't cause problems for anyone except people who may be lactose intolerant; such people may choose to eat more dark leafy green vegetables instead of dairy sources of calcium. Lead and heavy metals have been found in so-called natural sources of calcium such as bone meal and oyster calcium supplements, so you may wish to choose other sources of calcium. Pregnant and nursing women should take only calcium supplements their doctors recommend. People with a history of kidney stones should not take calcium supplements as they may increase the risk of getting another stone. While it's rare to experience side effects, stomach upset may be a side effect of calcium supplements; if you get an upset stomach, discontinue use. And as with all supplements, vitamins and herbs, tell your doctor or health care provider about any and all products you are taking, and ask for advice on supplements if you have any long-standing medical condition or are taking any prescription medications.